"In #Delhi, homeless laborers cope with wintertime nights by renting blankets to catch a few hours' rest. Those who can't afford to rent a quilt build fires, out of plastic if necessary, and crouch over them as they wait for the night to end. This winter, Delhi's government expanded its shelter system to accommodate 18,000, but the total number of homeless in the city is far larger — above 100,000, by some estimates. As a result, a sprawling gray market has taken shape. Like many of Delhi's businesses, sleep vendors are both highly organized and officially nonexistent. 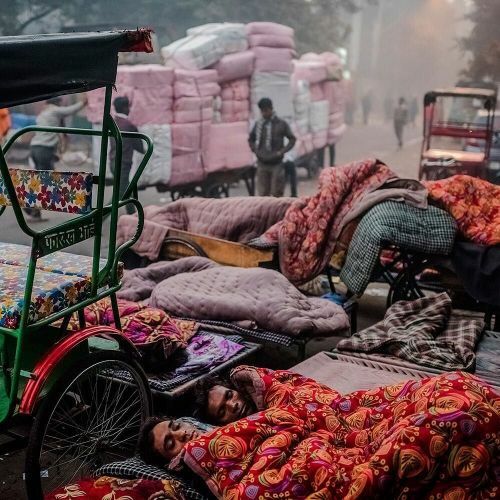 @danielberehulak photographed men resting under blankets in Delhi while on #nytassignment." By nytimes on Instagram.